Two-tone gold and rhodium makes a fashionable appearance in this 14K two-tone cross pendant with rhodium from Apples of Gold Jewelry. The 14K yellow gold of this pendant is paired with rhodium, creating a breathtaking two-tone look that will make you fall in love. The cross pendant is designed to have an open diamond shaped middle, and this unique pendant measures 23mm in width and 46mm in length, which is a nice size for every day wear. "Luke 6:37 - Judge not, and ye shall not be judged: condemn not, and ye shall not be condemned: forgive, and ye shall be forgiven." 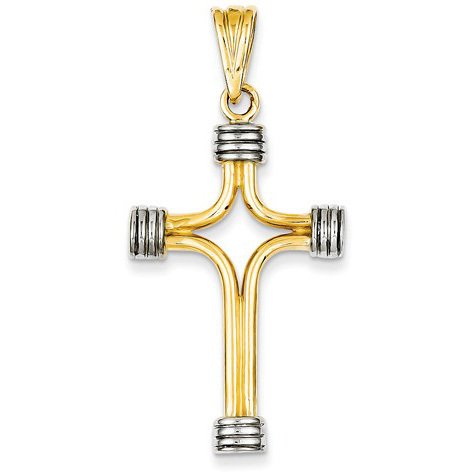 We guarantee our 14K Two-Tone Cross Pendant with Rhodium to be high quality, authentic jewelry, as described above.